I can almost hear the groans and see the grimaces as here we have yet another recording of those warhorses of the violin concerto repertoire from Mendelssohn and Bruch. These two highly popular scores make a predictable, if at first sight, risk-free coupling for the considerable talents of the Dutch violinist Janine Jansen. However, the drawbacks are that the competition in the catalogues is extremely fierce, as both scores have been recorded by virtually every violinist worth his or her salt, often becoming benchmarks by which performers are judged. In my collection I have several acclaimed recordings that are of such high quality that there is little to choose between each account. Jansen continues to make a significant impression on the classical music scene and Decca seem to have placed a great deal of confidence and weight in support of her promotion. I recall her making a successful return to the 2006 BBC Proms concerts this summer performing the Mozart Violin Concerto No. 5 in A major, K 219. We are told that on this recording of the Mendelssohn and Bruch concertos Jansen plays a violin by Antonio Stradivari, Cremona 1727 �Barrere�. The captivating second movement Andante is characterised by a swaying, lyrical theme. Jansen dismisses the difficulty of the solo part of the middle section with confidently relaxed playing that never borders on the languid, although I would have preferred slightly more weight. The ebullient Finale pays homage to the virtuoso tradition of the violin concerto. Jansen�s playing is buoyant and spirited, eminently matching Mendelssohn�s world of fairytale enchantment. The Leipzig Gewandhaus Orchestra, who have long historical associations with Mendelssohn�s score, and their conductor Riccardo Chailly provide the soloist with natural and sensitive orchestral support. In this highly competitive marketplace there are many excellent versions of the Mendelssohn Violin Concerto. Certainly this outstanding account can sit comfortably alongside the very best versions. My long time favourite recording is the one from Jaime Laredo, directing the Scottish Chamber Orchestra on IMP Classics PCD 829, c/w the famous Bruch. My copy provides no details of the recording venue and dates. This Laredo account, with the same coupling, has been reissued on the Regis label RRC 1152. I remain an admirer of the bold and characterful version from Kyung Wha Chung and the Montreal Symphony Orchestra under Charles Dutoit on Decca 460 976-2, c/w the Bruch concerto and the Scottish Fantasy. Another superb recording is the direct and stylish period-instrument version from Viktoria Mullova with the Orchestre R�volutionnaire et Romantique under John Eliot Gardiner on Philips 473 872-2, c/w the Beethoven Violin Concerto (see review). Composed between 1864-68 Bruch dedicated his Violin Concerto No. 1 to the eminent, Hungarian-born violinist Joseph Joachim who went on to premiere the revised version in 1868. Eclipsed by the tremendous popularity of the G minor it is often forgotten that Bruch actually wrote two other fine violin concertos as well as many other splendid scores. In his day he was primarily recognised for his large-scale choral works that earned him a reputation that for a short time outshone that of Brahms. Another favourite version of the Bruch was recorded in Leipzig in 1977 by Salvatore Accardo with the Leipzig Gewandhaus Orchestra under Kurt Masur on Philips Duo 462 167-2. This is an interpretation that sees the stylish Accardo providing vital and characterful playing. The desirable couplings on Accardo�s all-Bruch set are the Violin Concertos 2 & 3; Serenade, Op. 75 and the Scottish Fantasy, Op. 46. Primarily for his exquisite tone and thrilling playing the historical 1962 recording from Jascha Heifetz with the New Symphony Orchestra of London under Sir Malcolm Sargent on RCA 09026 61745-2 draws considerable approval from a large group of admirers. The generous RCA disc also includes the Scottish Fantasy, Op. 46 and the Vieuxtemps Violin Concerto No. 5. This advance promotion recording provides very little information on Bruch�s Romance for viola and orchestra in F major, a late work that I believe was composed around 1911. Fore this rarely heard score Jansen exchanges her violin for the viola to impressive effect. Her playing is highly expressive with a yearning quality and melancholic richness. In her hands Bruch�s score is a very personal and romantic love letter performed with a crystalline beauty. These are very impressive recordings from the Decca engineers that are vivid and well balanced, although there is just a hint of sharpness in the forte passages. Evidently these recordings were made at live performances, yet I could not detect any audience applause or noise. I believe the Decca label have missed an opportunity to increase the desirability of the release as there is certainly sufficient room on the disc to have accommodated another concerto such as: Bruch�s Violin Concerto No. 2 in D Minor; Spohr�s Violin Concerto No. 8 in A minor, Op.47 �In Form einer Gesangsszene� or Vieuxtemps� Violin Concerto No. 5 in A Minor. 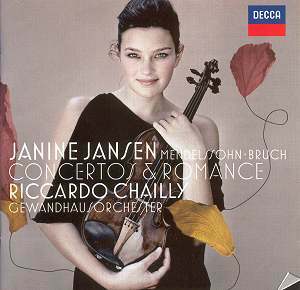 Janine Jansen fully deserves her exalted reputation and doesn�t put a foot wrong with this excellent Decca release of two staples of the violin concerto repertoire.